In addition to the various subjects that motivate the many posts that find a home here at Goannatree I am always working on other projects. For the next 12 months or so I am embarking on a project looking at a series of tracts (think short pamphlets, about 10-12 pages long) published between 1795-1798 known as the Cheap Repository Tracts. I am focusing on a reviewing the bibliography of the tracts and the social and political and religious environment that stimulated such a controversial, and diverse, group of tracts to be produced. I know reading and writing on a series of politically and religiously motivated pamphlets may seems pointless or at least not relevant to your everyday life. But let me explain why I think it is important. Firstly, these tracts appeared in a time of great change – a response to the French Revolution across the channel, when the average Brit was beginning to have access to an educaiton that would provide him (and progressively her) with the skills to read, and when the average working man and woman began to participate in public debate. It would be another century and a bit before women would get the vote, but you get the picture. Secondly, the group of tracts were marketed by peddlers, a 18th century version of viral marketing – the facebook of the 18th century if you will. I call Hannah More a media mogul because this group, known as the Cheap Respository, because they sold for ha’penny or a penny, sold about 2 million copies by the end of 1796. That is very impressive numbers. I don’t think any magazine or periodical publisher today would scoff at those numbers! 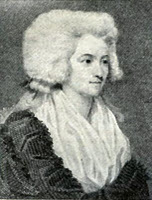 Hannah More, a conservative spinster (who was not afraid to speak her mind) was the organizer (the managing editor, almost) of a group of about 12 major British political and religious figures who contributed stories, poems, sermons and songs (sung to the tunes of well-known drinking songs). Part of my project is to try and work out who wrote what – most of the tracts were published anonymously or with a one or two letter pseudonym (like Z, L, M). This is a big challenge – I am delving into linguistics and computer based applications for stylometrics and stylistics….these are new terms to me too! Where might have I heard of Hannah More? Hannah More was a character in the recent movie Amazing Grace (2007). As a friend of William Wilberforce, Hannah More was active in the abolition movement. She was also actively involved in setting up Sunday Schools and Day Schools in the Mendip Hills area of England. Previous post: What does “scholar-blogger” mean?